The idea for the scavenger project started when I saw a photo on Instagram of vultures feeding on a carcass. 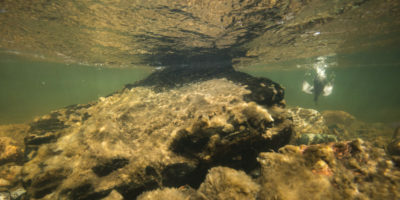 The image was distinctive because it was taken within the deteriorating carcass. At the time, I was attending WiLDSPEAK, a conservation photography symposium. The presenters’ passion for conservation and wildlife was inspiring, and that made me want to start my own project. I decided I wanted to capture the wildlife in Nebraska scavenging on a carcass and bring those opportunistic hunters to light. At the time, I had no idea how I was going to start the project, but I was ready for the challenge.  Being a full-time student at UNL, it was challenging for me to find the time necessary to conduct this scavenger project. Not to mention, I had no idea where I was going to find a deer carcass that was in early stages of decomposition. My goal was to show the people of Lincoln the wealth of biodiversity that surrounds the city. My hope is that if people care about the species, then they will want to protect the places they call home. Going into my last semester of college, I approached Michael Forsberg with my idea to do an Independent Study. He and I talked it over, and my project began. I never used camera traps before, so this was going to be a learning experience for me. I came into this project thinking it was going to be easy. I was wrong. The first step was to decide where I should conduct my project. Just outside of Lincoln, Nebraska are the endangered saline wetlands that support a variety of threatened flora and fauna species. I wanted my project to have an impact in the Lincoln community, so I chose Marsh Wren a saline wetland ecosystem within the Lincoln city limit. 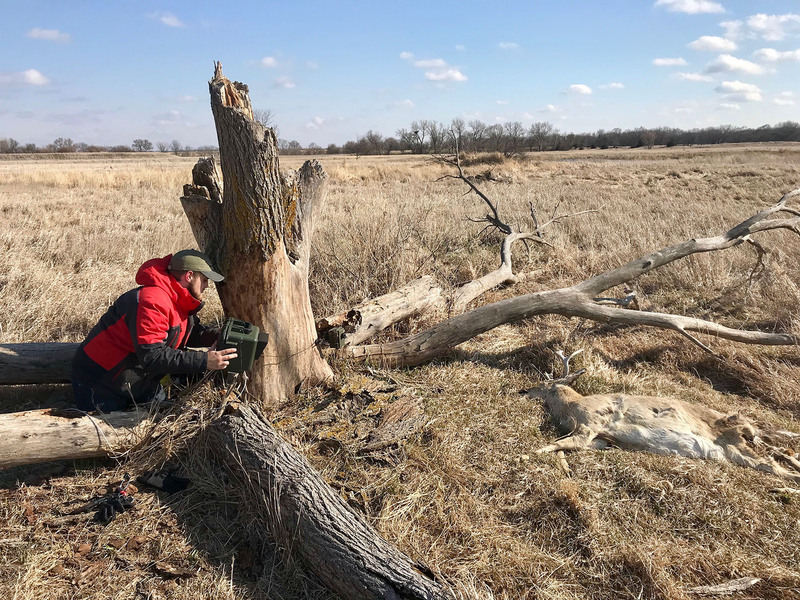 After exchanging a few emails with Dan Schulz, the resource coordinator for Marsh Wren, I was granted access to place camera traps on a deer carcass within Marsh Wren. Now all I had to do was… find a deer carcass. 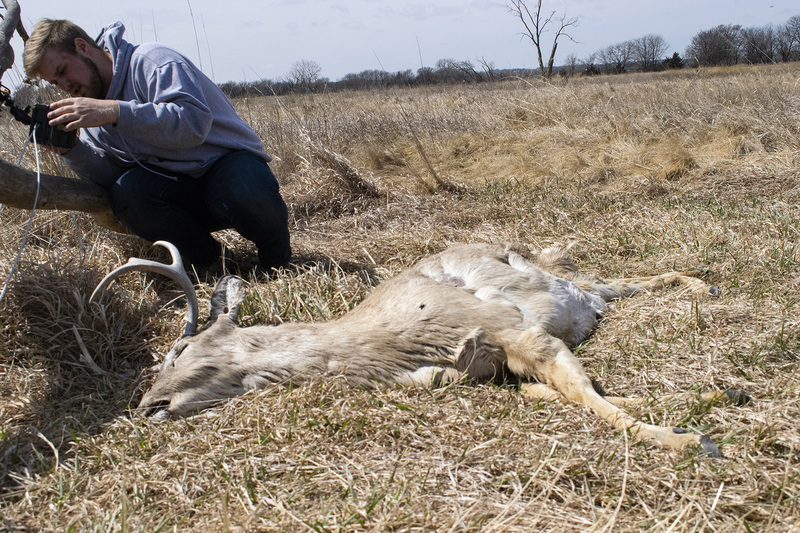 In the state of Nebraska, a permit is required to collect roadkill. I reached out to Dina Barta, the conservation officer for Lancaster County. She referred me to Mike Fritz, a zoologist with Nebraska Game and Parks Commission, who pointed me to the application of a Science and Education Permit for collecting roadkill. 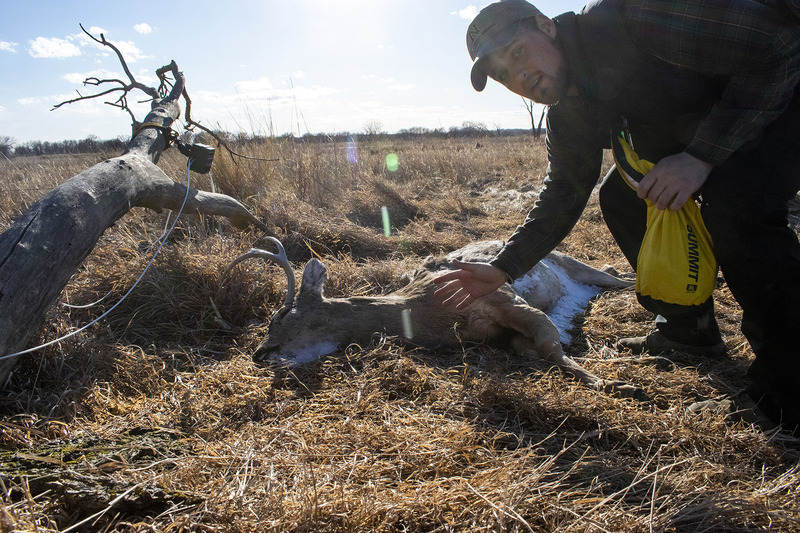 I applied, and within a couple of weeks, the Nebraska Game and Parks Commission granted me a permit to collect up to four deer carcasses. While I was waiting for my permit and deciding on the location for my project, I was working with Jeff Dale, the owner and engineer of TRLcam, to create the DSLR camera trap infrared trigger and housing. After Jeff and I completed the camera trap, I was ready to start my project. However, I still needed one more thing, a deer carcass. I spent time driving around looking for a carcass, but that was to no avail. I decided to reach out to the Lancaster County Sheriff’s Department and asked them what they do when an officer spots a carcass on the side of the road. They directed me to Industrial Services, which is the company that picks up roadkill carcasses around Lincoln. After a phone call with one of the managers, they took down my information so that once a driver collected a carcass, they would call me to come pick it up. I waited a couple of weeks and received no calls. At this point, I was getting frustrated. 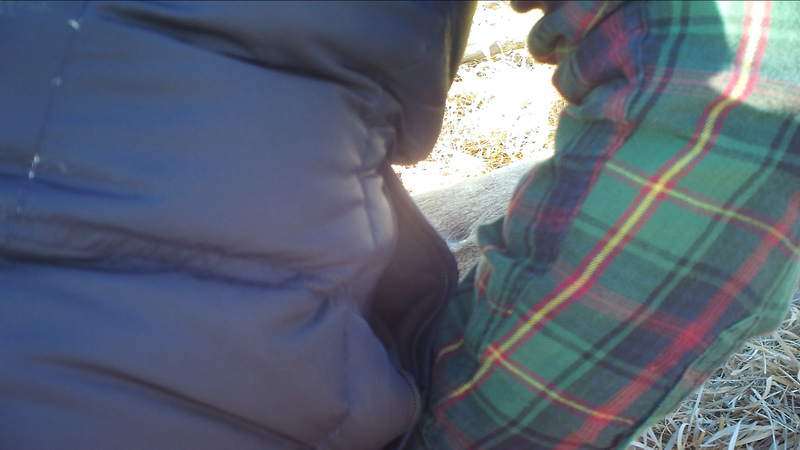 I was well into the school semester, and I still didn’t have a camera on a deer carcass. My patience was wearing thin. Lesson One: patience is a virtue. One morning, I was sitting in class when I received a call from my girlfriend that there was a carcass on 56th St. I packed up my things and left immediately. 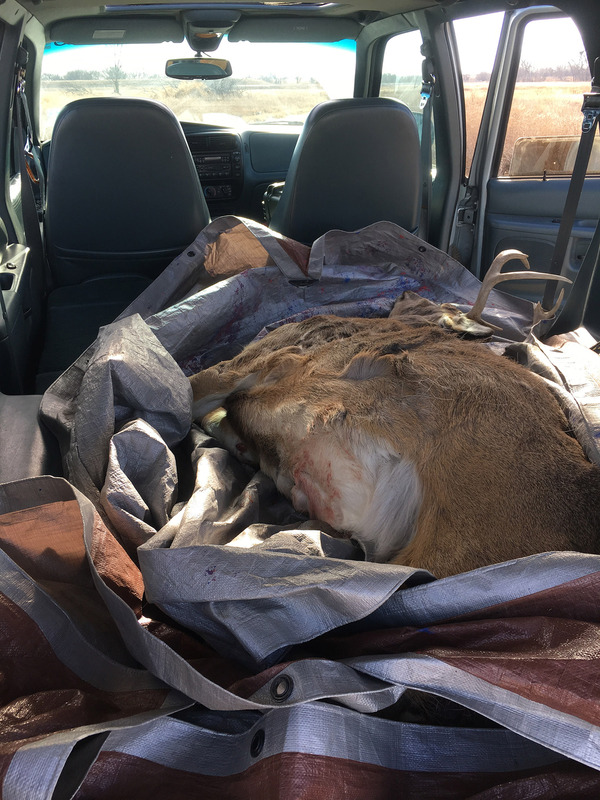 I was so excited about the carcass that I didn’t bother to stop and consider how I was going to get the 150 lb., bloodstained deer into my car by myself until I was about halfway to my destination. I quickly picked up some rope and a tarp, hoping it would be enough. All I could think about as I was driving to the carcass was that I hope no one else picked it up before me. (A very odd thought, looking back). I arrived, and to my surprise, it was a young buck. I had an interesting time tying the rope around its body and dragging it onto the tarp. As I heaved the carcass to the trunk, Industrial Services pulled up. The driver looked irritated that he had come across someone else collecting the carcass. I walked up to his window and explained to him who I was. He reached out to his dispatch, and I was cleared to take the carcass. He was kind enough to help me load it into my car. I was grateful because it was becoming apparent that I wasn’t going to be able to do it by myself. After we loaded the deer carcass into my car, I let out a sigh of relief and expressed my gratitude. That same day, I went home, gathered all of my equipment and drove to Marsh Wren with the deer carcass in the back of my car. Luckily, Schulz was out there, and he allowed me to drive down to the location I chose to position the carcass. Deer Carcass in the back of the car. (Grant Reiner)I placed the deer carcass within a patch of grass next to a fallen tree that had been dead for quite some time. I attached my DSLR camera trap to the decaying stump. However, when I turned the camera on and checked the motion sensor I found that the motion sensor was not triggering the camera. The trigger was broken. I had waited weeks to get a deer carcass, and now that I had one, my camera wasn’t working. Lesson Two: always check the gear before going out into the field. To fix the camera, I had to drive to TRLcam on the other side of town. After a few hours of tinkering with the motion sensor, Jeff came to the conclusion that the board had been programmed incorrectly, and that I had to run a cord to an external motion sensor to get the camera on the carcass that day. Jeff willingly helped fix the camera trap, and I drove back out to Marsh Wren to successfully place the DSLR camera on the stump of the fallen down tree. I chose a frame that would both show the location, while capturing wildlife feeding on the deer carcass. My next plan was to place capture wildlife at night. I decided to use a Reconyx camera trap that uses an infrared light along with a motion sensor to capture video and stills. I did not use an external flash with the DSLR camera because I did not want to disturb the behavior of the animals. It was important to me that the camera traps caused little to no interaction with the wildlife because I wanted to be able to capture behavior that usually is not seen by people. After I set up both of the camera traps, all I had to do was wait. I checked the SD cards and changed the batteries of the camera traps every two weeks throughout most of the projects’ duration. During the first two-week span, I only captured herds of deer passing through, and no scavengers. At the end of the two week period, I encountered my second obstacle. My DSLR camera was having a lot of false triggers. My initial response was to turn down the motion sensor sensitivity to the second lowest setting. Come to find out, that still would not be enough. I attached the Reconyx camera trap to a branch adjacent to the DSLR camera focused on the underside of the deer carcass, which was the third obstacle I encountered. I had not attached the camera tight enough to the branch, so when it snowed, the camera was pushed face down. The images below were the frames for two weeks. I wasn’t able to capture anything because the entire frame was snow and grass. So, I decided to change the location of the Reconyx to a branch of the fallen tree next to the deer carcass to create a better frame and angle. 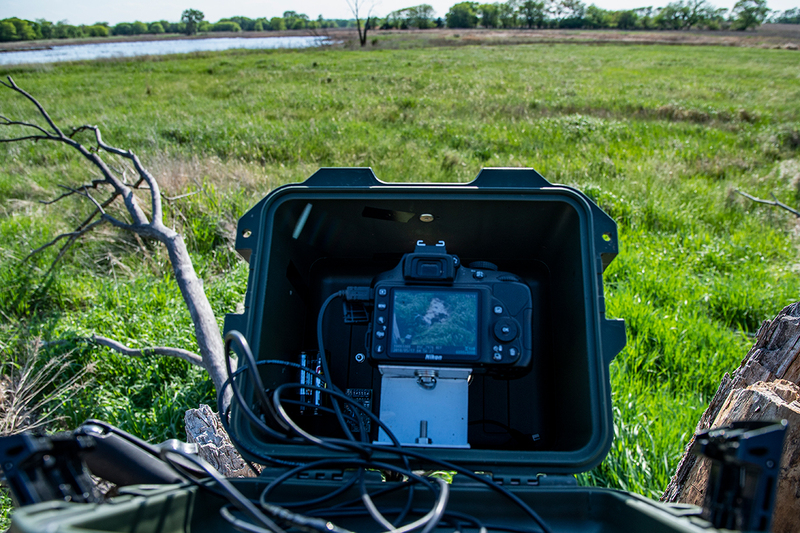 After I noticed images were being captured from my DSLR, I was excited to check my Reconyx. On one of the nights during the second two-week span, my DSLR was triggered but because the light was so low it caused the shutter speed to slow creating a blurry image of the scavenger. During the day my DSLR camera captured a rough-legged hawk feeding on the carcass. However, when I went to check the Reconyx, the only image on the card was of the side of my body. The reason why I did not capture anything is that I messed up with the battery placement. I was so focused on changing the location of the camera and securing it tightly which caused me to make another mistake. When I went to switch out the batteries I accidentally put one of the batteries in backward. At the time, it appeared as though the camera was working properly because the inside screen turned on. So, I armed the camera and left. Lesson Three: triple check to make sure all of the cameras are working properly. I made sure to triple check the Reconyx throughout the rest of the project’s duration. My second frame with the Reconyx was not the strongest, however, throughout the coming weeks it produced some interesting video and stills of an opossum regularly visiting the carcass at night. The next week, Forsberg came out to Marsh Wren to lend me a hand with the issues that I have been having, including: the framing, false triggers, and batteries dying quickly. After I received help from Forsberg, the Reconyx captured more footage than before. Lesson Four: create a frame that is intimate. These three images were all taken in the same night. The raccoon was chased off by the opossum, and the opossum was scared off by the deer. 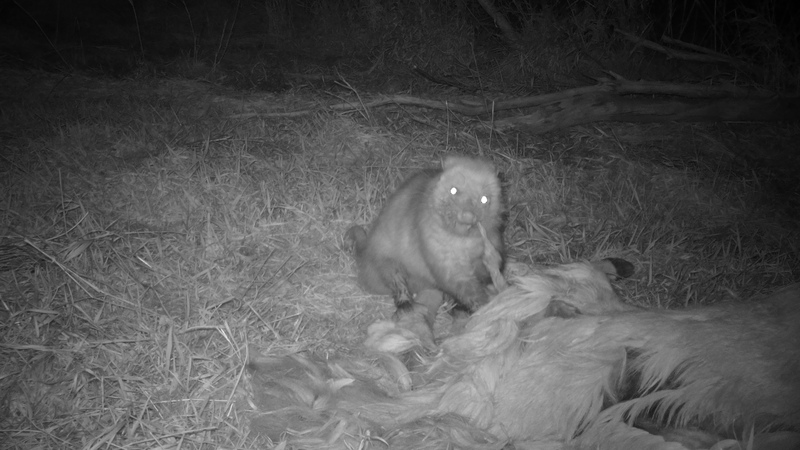 This footage was the first time that my camera traps were able to capture behavior among different species interacting with one another. Looking at the biodiversity of Marsh Wren was my initial goal with this project. However, camera trapping was much more difficult and detail-oriented than I expected, and I learned a lot. I learned that creating connections and gaining access to land takes time and effort. I learned that patience is the key to success. I learned always to check to make sure equipment is working before going out into the field. I learned when I’m changing batteries and SD cards in the field, making sure all of the cameras are working correctly. I learned to create intimate frames for higher impact images and to make sure that all the cameras are securely in place. The scavenger project required weeks of phone calls, creating connections, gaining approval, broken cameras, troubleshooting, false triggers, dead batteries, and stupid mistakes. Conservation photographer, Dave Showalter, once told me that some of the most important things learned in life are through the experience of failure and that learning how to fail is key. Because I’m pursuing a career in conservation photography, I know I am going to be using camera traps again. I learned an immense amount from the challenges presented during this project, and will continue to apply what I learned to my future professional projects. I will carry the lessons I learned from this experience for the rest of my life.